Cill Rialaig has six self-contained artist cottages, a meeting house (social room is without electricity) and laundry room. Cill Rialaig founder, Noelle Campbell-Sharp, also has long-term plans to build a world-class recording studio at the retreat. An arts centre—that includes a gallery, shop, café and office for the Cill Rialaig Foundation—is located in the village of Dun Geagan, Ballinskelligs, almost five kilometres (three miles) away. I was fortunate to receive a writing residency at Cill Rialaig—pronounced “kill reel-ig” for the non-Irish reading this article—for the period November–December 2012. During this time I completed the first draft of my third poetry collection, Wild. Cill Rialaig has six self-contained artist cottages, a meeting house (social room is without electricity) and laundry room. Cill Rialaig founder, Noelle Campbell-Sharp, also has long-term plans to build a world-class recording studio at the retreat. An arts centre—that includes a gallery, shop, café and office for the Cill Rialaig Foundation—is located in the village of Dun Geagan, Ballinskelligs, almost five kilometres (three miles) away. Each artist is provided with their own cottage free of charge. Cottages have a large open plan living/working area, separate kitchen and bathroom, and a loft bedroom via a sturdy ladder. The cottages are basic, but everything you need to make a home for the time you are there is supplied (bed linen, plenty of extra blankets, soft furnishings, dining table, kitchenware, etc.). Residents provide their own transportation, food, supplies and Internet access. I was very fortunate to be given the Seaside Cottage, which sits independently from the other cottages. Perched on the cliff with glorious views of Ballinskelligs and the town of Waterville, Seaside Cottage is the oldest of the rescued/renovated homes. The resident sheep are never far away and some are known to bed down beside the cottage doors and underneath the windows during the night. The cottages are cold in winter, but that is to be expected with minimal heating (supplied by the Cill Rialaig Foundation for a small utility fee). Artists are responsible for providing fuel for the wood/peat stove and local turf and wood suppliers visit Cill Rialaig when needed. However mass-produced peat briquettes available at petrol stations and supermarkets are the most efficient and compatible way to keep you warm and comfortable. Irish artists complained about the cold much more than I did, but I did spend more on logs and peat briquettes than first anticipated. 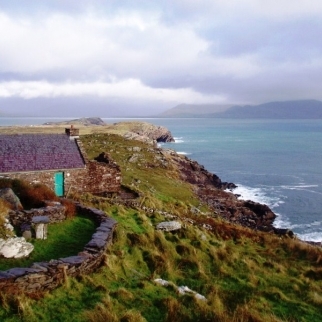 Cill Rialaig is one of the most remote retreats available for artists. Your Cill Rialaig experience will depend largely on how you respond to the environment and if you are well organized before you get there. I knew roughly what to expect before I arrived because I know Ireland incredibly well and I love its wild places, and this is the very reason I applied for a residency at Cill Rialaig. But someone new to Irelandmay not be fully prepared and it might take them time to adjust to the conditions. For the record, Dublin is not Ireland. The real Ireland is rural Ireland. And if that’s not enough to take in then there is Kerry, a complete entity in itself in so many ways. As a whole, Kerry is a gorgeous and spirit-full county, but the locals will most likely not want to get to know you. There are always exceptions, of course. In a far flung southwest hamlet you will also find the Cill Rialaig staff lovely, friendly and always helpful. You experience nature and all of its countenances at Cill Rialaig. There is a wild array of sea and land birds, and the calls of wren or hooded crow are never far away. The sea is a formidable presence of extraordinary strength and dramatic grace—so too Sceilig Mhichíl, that most mystical and mysterious of manifestations. The locals (the good sheep of Cill Rialaig) are gorgeous and I miss them. Bolus Head is magnificent in itself and daily walks are highly recommended regardless the type of weather. Be sure you spend time exploring the archaeological aspects of this very special place. On a purely practical level, the town of Cahersiveen (about a twenty minute drive away) is the best place for grocery shopping. For those overseas residents without a car who think they can rely on local cab services—think again. Most don’t want to travel out to such a remote location. Fellow artists in residence with cars can often be very generous in providing lifts into town and beyond.And when it comes to the weather, expect anything and everything.